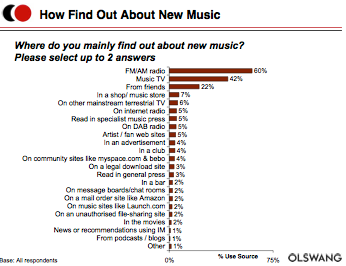 31% have purchased downloads or CDs of music discovered on these sites. Sharing of music — another important channel for discovery — is also covered. 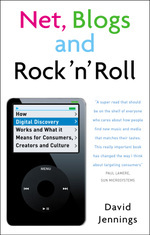 The survey found that two thirds of their sample shared music with their friends, and 15% share 'a lot of it'. Half do at least one of the following activities to share music: use IM, use email, share hard disks or download illegally. On the other hand, when buying CDs, three quarters of the group did not sample an album by downloading tracks before buying it. Presumably they either heard it on the radio or TV, or they just took a punt, based on reviews, advertising or previous familiarity with the artist. The survey sample comprised more than 3,000 respondents in the UK, who were interviewed in July this year. Half of them were under 25, and three quarters under 35. The results include several comparisons with a similar survey last year. Here's a press release that summarises some of the other findings.